This Spring has been a weather roller coaster. 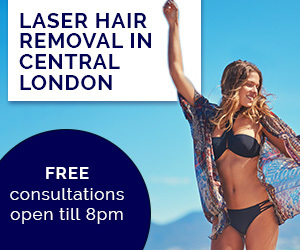 From gorgeous sunny days to miserable rainy ones, it feels like England will never settle! I'm one of those people who's moods change depending on the weather - I feel super productive and happy on sunny days, and down and lazy on rainy ones! 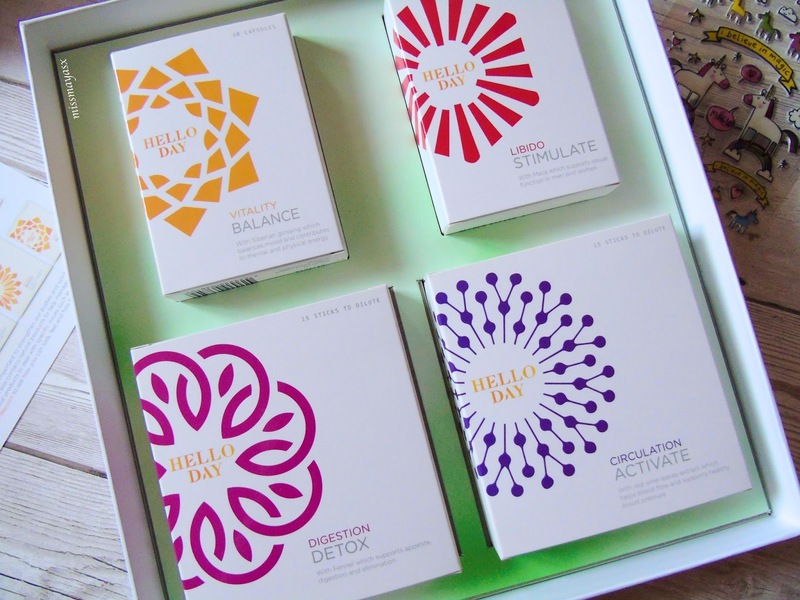 So, when I heard about the Hello Day Spring Box I was very excited to try it out for myself to keep on top of my mood swings! I love the box itself, it's so pretty and screams 'Spring'. The colourful butterflies make it a great decoration for Spring time. I wasn't expecting the box to be as big as it was, I was happily surprised as it's easy to store and useful to store medicine/supplements inside once open. 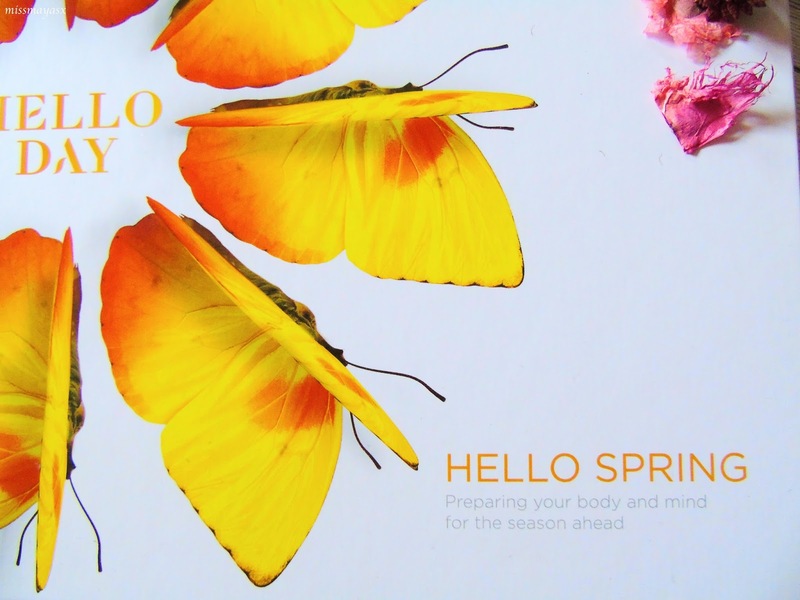 The Hello Spring box comes as a seasonal kit (there are also Summer, Autumn and Winter boxes available), containing 4 coordinated food supplements to improve your health and wellbeing. The Spring Box comes with Vitality Balance, Circulation Activate, Digestion Detox, and Libido Stimulate (ikr). 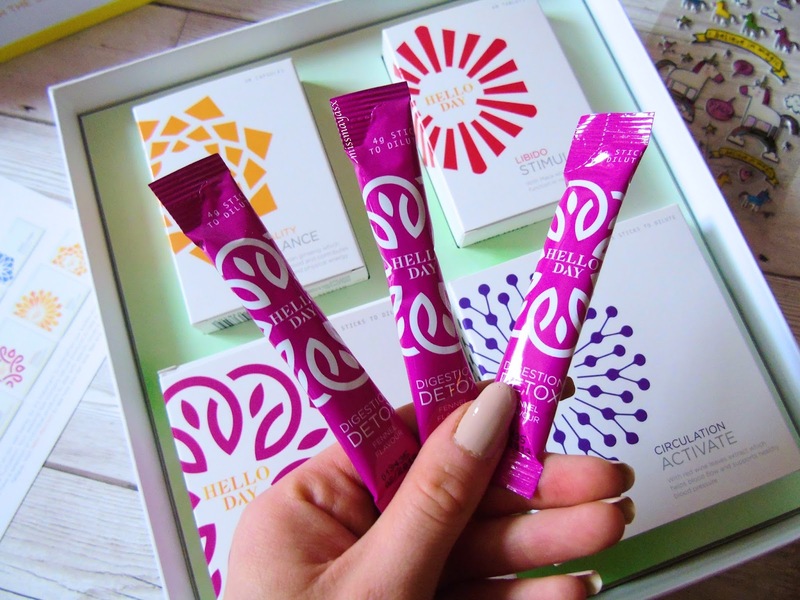 I was really keen to try out the Detox sticks which you dilute in water the most as I have recently been trying to lose weight and tone up, and what's a better way to start than have a full on body detox? 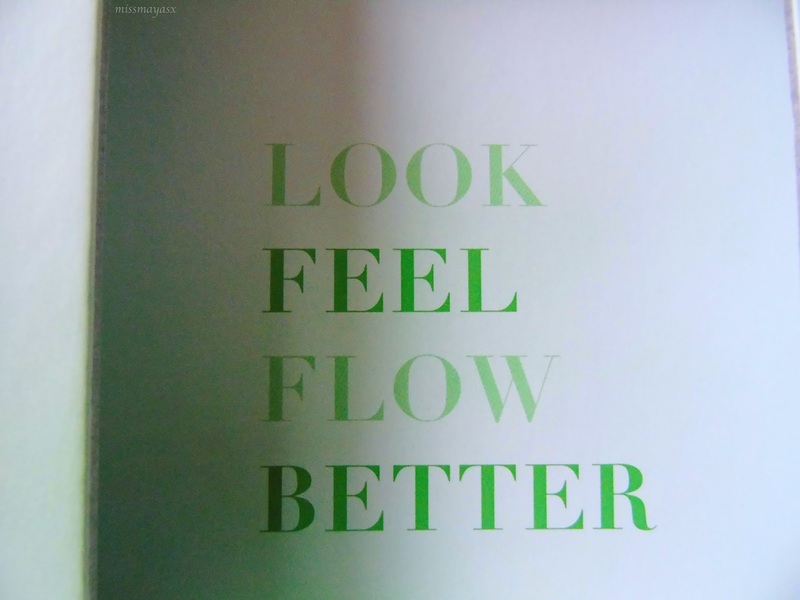 Both, Digestion Detox and Circulation Active come in a form of 'sticks' which contain the product in powder that needs to be diluted in a glass of water and best taken during lunch. The Digestion Detox is formulated with Fennel which helps support a healthy appetite and aids the digestive tract to detox. Like I've mentioned above, I was very excited to try this one out as I feel like I've definitely put on some weight over Winter, and I find that this product works well but I don't like the taste of it so as soon as I drank it, I follow it up by a full glass of water to wash down the taste! On the other hand, the Circulation Active sachets contain Red Vine Leaf and Blackcurrant Berries (much more tasty) which help improve blood circulation and lower blood pressure naturally - my dad would love this. For best results this should be taken before dinner diluted in a glass of water - it's a pre-dinner treat due to its sweet taste! The Libido Stimulate tablets - not a very well spoken topic on this blog, helps to reduce fatigue, promote desire (yup) and restore positive wellbeing. This little one is formulated with Magnesium and Maca Root which are the key ingredients for supporting sexual function in men and women, and has best effects when taken after dinner. Last but not least, the Vitality Balance are great multivitamins combining Magnesium and Siberian Ginseng to reduce tiredness while strengthening mental and physical energy (yes please). This one can be taken whenever with a glass of water to help keep it down but I like to take mine in the morning with my breakfast to start the day off nice and fresh! 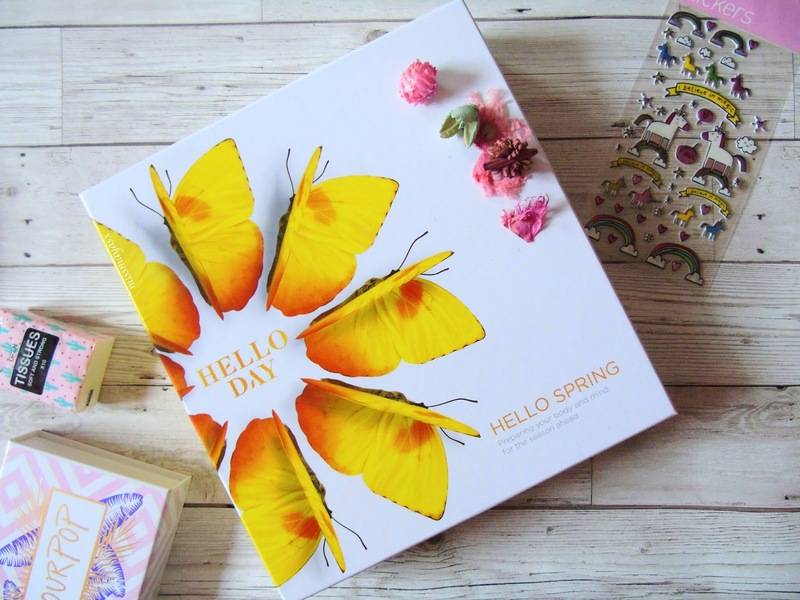 Overall, I'm very happy with my Hello Spring box, I'd love to try the other boxes available throughout the year to see if there would be a visible difference. I do have to say that I feel more energised and less bloated thanks to these supplements and following a healthy diet. 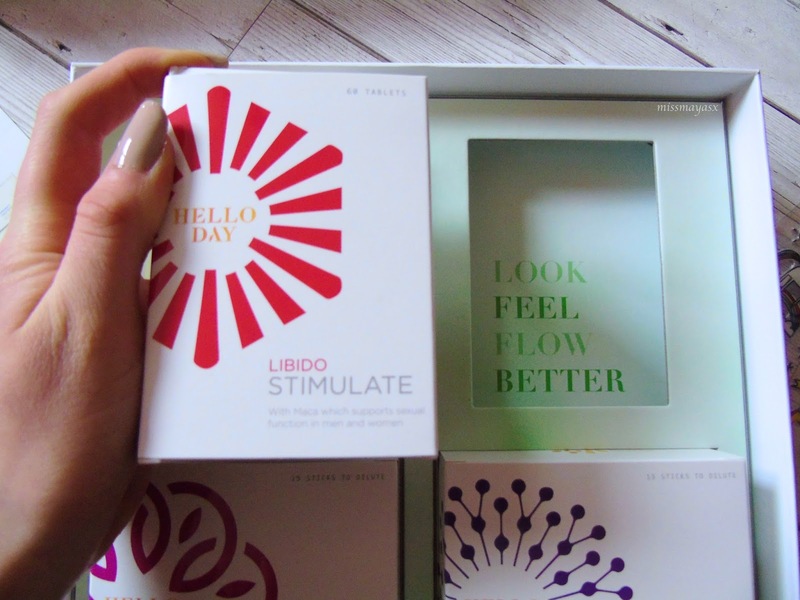 You can buy a Hello Day Box for £69.00 here, or download the free Hello Day app from the App Store or Google Play to manage your health and wellbeing. 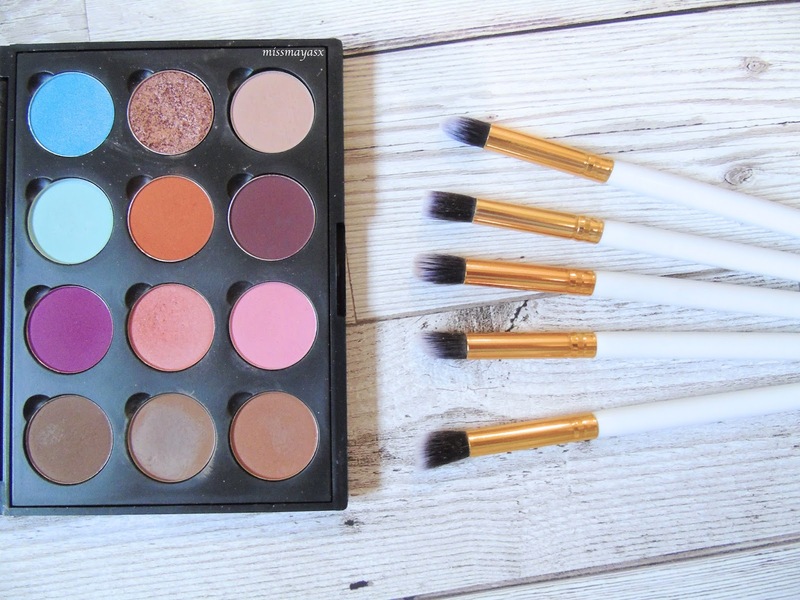 *The Hello Day Spring Box was sent for me to review, all opinions are honest and my own! 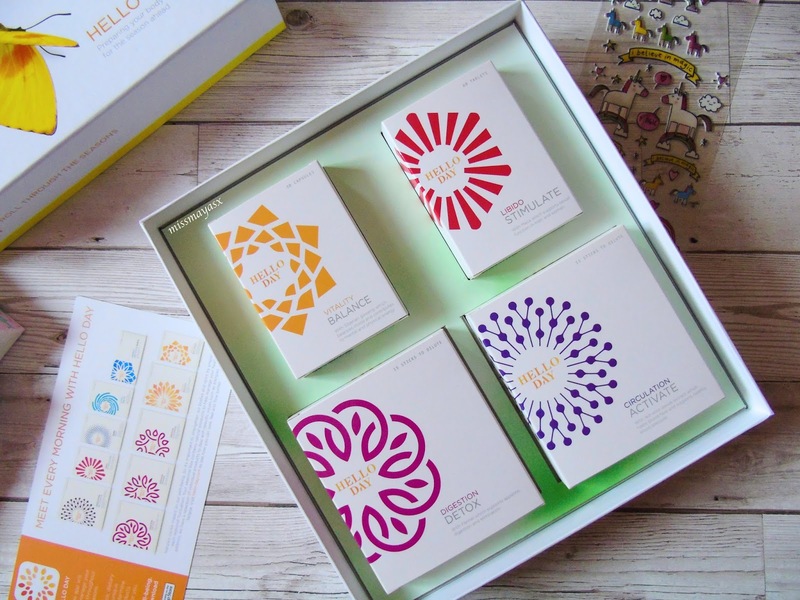 Have you tried a Hello Day seasonal box?